The last day of my travel I drove back To Oslo from the Hurtigruten quay in Trondheim. As a token and gratitude that the whole trip went well with no problems I find it a bit symbolic to end this first phase of my daily reports from my tour to North Cape with an evening photo of Trondheim's well known Nidaros Cathedral. Nidaros Cathedral was built beginning in 1070 to memorialize the burial place of Olaf II of Norway, the king who was killed in 1030 in the Battle of Stiklestad. He was canonized as Saint Olaf a year later by the bishop of Nidaros (which was later confirmed by the pope). 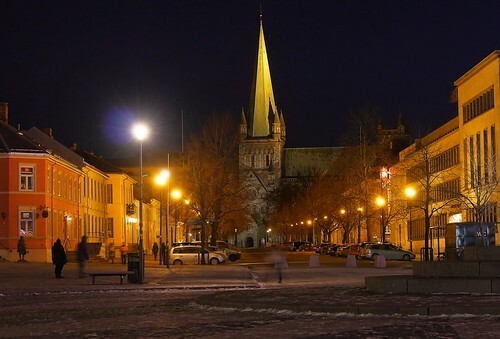 It was designated the cathedral of the Roman Catholic Archdiocese of Nidaros from its establishment in 1152 until its abolition in 1537 under the Reformation. It is the northernmost medieval cathedral in the world. Since the Reformation, it has served as the cathedral of the Lutheran bishops of Trondheim (or Nidaros) in the Diocese of Nidaros. The architectural style of the cathedral is Romanesque and Gothic. Historically it has been an important destination for pilgrims coming from all of Northern Europe.